Halloween is always a great time of the year, this year our Halloween Dessert table had some wonderful Halloween ideas including Cauldron, Pumpkin and Eyeball cake pops, some wonderful Witch Hats and Bat cookies, pumpkin cup cakes and small jelly shots. We decorated the table using a wonderful haunted house and some simple purple lanterns. The printables used for the Halloween Dessert table were created by Chic Party Ideas and will soon be available in our shop. To decorate the table I started with black crushed velvet and used a wonderful haunted house that I found as Cosco. I added purple lanterns and some spooky old style picture whose faces changed from sweet to scary. I created a lot of cake pops using Cauldrons, pumpkins and eyeballs. I places these in individual cauldrons for display, this looked really effective and I will soon post a tutorial on how to make the cauldron stands. I used small skulls for jelly shots (child friendly) and placed a couple of sour snakes in each. Topped with a Jellified grave worm topper they added bursts of colour to the table. Halloween cookies are a must for a Halloween Dessert table. I made simple Witch Hat and Bat Cookies, with a simple decoration that was easy to make. You have to have Cup Cakes on a dessert table, I made simple vanilla cup dates and decorated with orange fondant icing and using a pumpkin template to chatter black sprinkles. 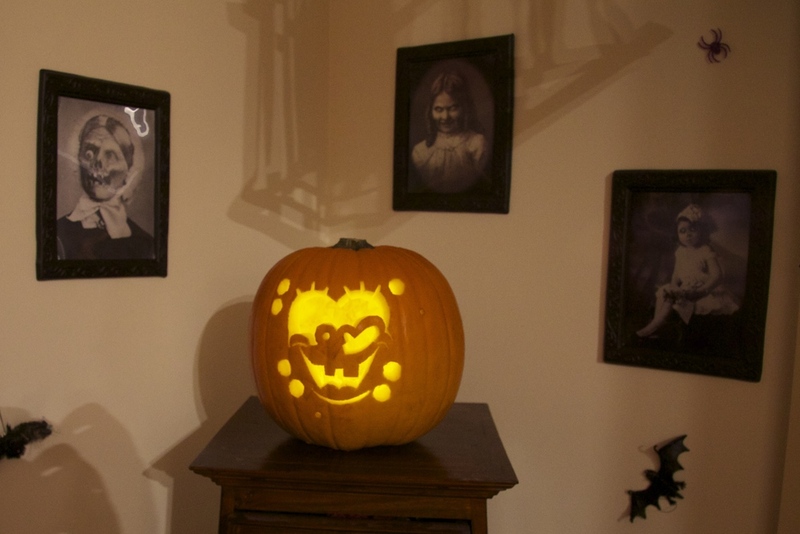 The must have halloween Jack O Lantern, this is always my husbands task at Halloween and I'm sure this is sponge bob. My witch's and ghost stood guard of the dessert table and that concludes another halloween Party.